The stadium in south eastern Canada opened in 2007 with a capacity of 20,000. 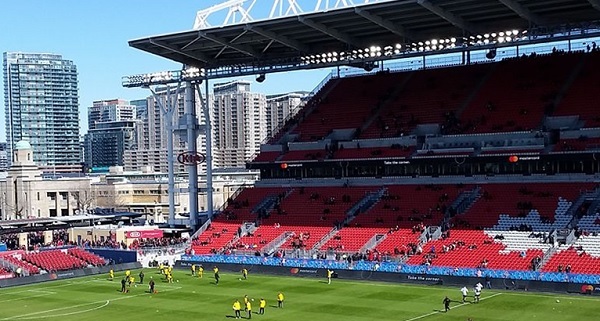 A new record attendance for a Canadian rugby union game was set at the BMO Field in 2013, when 22,000 people showed up for a match between Canada and New Zealand. Tenants Toronto Football Club became the first football club from Canada with a value of $100 million. They drew an average home attendance of 20,000 in their first-ever Major League Soccer season. Toronto FC signed several famous players in their first years of existence, like Torsten Frings. He played numerous games for Bayern München, one of the first FIFA Club World Cup winners, and the national football team of Germany, one of the first FIFA World Cup winners. Impact de Montréal, Toronto FC and the Vancouver Whitecaps became the first Canadian Major League Soccer clubs with 100,000 followers on their main social media page.